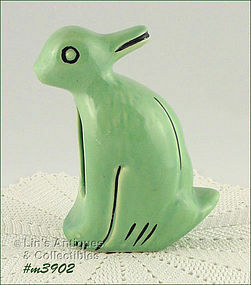 This difficult to find planter has been in my personal collection for a number of years – it’s the duck and/or rabbit planter – depending on the way it’s turned! Planter measures 6 ½” tall (at tallest) and is in super condition. It has no chips, no cracks, does have minor crazing (not worth mentioning). This planter is unmarked but I saw it in a Weller reference book. It is a super addition to a collection! This listing has a beautiful pair of candle holders made by Weller Pottery! 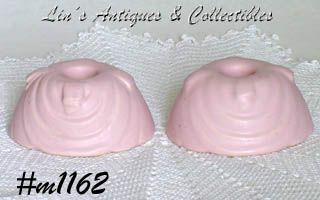 Candle holders are pink with a satin/matte finish. The design is cascades or drape (reminds me of swags). They measure 1 3/4" tall, base measures 4" long, 3 1/2" Wide. Both are in excellent condition with minor crazing -- that's it!